Once again it’s been too long since I had time to play poker in Atlantic City, but I managed to get there today. (It helps that DC Comics is closed all week!) I sat down at a $1-2 No Limit Hold-em table at about 10:30 AM and played for about 1.5 hours, winning a few small and medium sized pots, but also losing a few. No big, dramatic hands. At noon I broke for lunch a few dollars ahead. After lunch I sat down at another table and played for two more hours. This time I was getting better cards and in bigger hands. My $200 stack of chips went up and down in larger bites. Early on I was dealt 4-6 in the big blind, and no one raised, so I was in the hand with about five people. The flop came 6-6-6, giving me quad sixes! This was a potential Bad Beat Jackpot winner, if my sixes were beat by a better hand, so that got my attention! I checked the first round, and a player to my left bet $10. Everyone else dropped out, I called, and it was just the two of us. Next round I bet $20 and she called. Things were looking promising, at least she had a playable hand. Another round of $20 bets (didn’t think a big raise would have been called), and I won against her full house. No Bad Beat payoff. At one point I was up about $5o and found a pair of Aces in my hand. I got into a bidding war with another player, but the cards on the table didn’t look promising for me. I had a flush draw, but otherwise just my Aces. When he went all-in for $135 I couldn’t call, and that brought my stack down considerably. I had decided to leave at 2:30, and it was 2:15. I’d only have a few more hands to play, and my stack was down to $100, meaning I was behind $100. I was dealt Ace-Jack, which seemed promising, and the flop turned up another Jack and two low cards. Another player bet $20. I decided it was time for a big move: either double up or go home broke. I went all in. He called. I figured I had about a 50-50 chance of winning with my pair of Jacks, putting him on a possible two pair or even trips (three of a kind). Luckily for me, another Jack came out on the River, giving me trip Jacks, and a big win. The very next hand I was dealt Ace-King. The flop brought out another King, giving me a pair. I bet strong, and took that pot, too. At 2:30 I left the table ahead $70. A nice payoff for a fun few hours of poker. Wish I could play more often. This entry was posted in Poker on December 30, 2011 by Todd. This entry was posted in Poker on March 8, 2011 by Todd. Saturday I went back to Atlantic City to play poker at the Taj Mahal casino for the first time this year. I sat down at about 10 AM at a cash game and played for an hour, winning $86, largely from one player who I thought was making a lot of loose calls. Every time I bet he raised me, and finally he went all in for $40. I had a pair of sevens, so I called and beat his ace-high hand. At 11:15 I entered the small morning no-limit hold-em tournament for $65. I did well in the first hour, doubling my chips, then coasted for a while, winning one large pot in the second hour. I had pocket queens, the flop was jack-ten-five, the turn was another jack, giving me two pair. One other player kept raising, and I thought it was likely he had me beat with at least three of a kind, maybe a full house, but his raises were low enough to keep me in the game. Finally the river turned another queen, giving me a full house, queens over jacks. I went all in, and he called with a lower full house, so I doubled up. That kept me going well into the third hour, where I won a few small pots. The field of 50 dwindled, and by the time it was down to 11 players in the fourth hour, my stack was getting short. I managed to stay around into the money, though, going out in seventh place with a win of $109. So, the cash game win of $86 plus the tournament win of $109 makes $195, minus the $65 entry fee on the tournament is $130. I contributed $5 to the bubble boy loser, finishing just out of the money, as did the other 9 players remaining, and spent $8 on lunch and $5 on parking, so my real win for the day was $112, which is just fine. I enjoyed playing, though my legs do get sore from the cramped position they’re in at the table. I don’t know how older guys can sit at big tournaments for days on end! It was a fun day overall despite that, and I wish I had time to play more often. This entry was posted in Poker on January 29, 2011 by Todd. I haven’t had time to play poker in Atlantic City in months, but finally did today. I decided to play at The Borgata, after checking their website, since they had a $50 tournament this morning. Last time I played a tournament there on Sunday morning it was $120. It’s a new format with two rebuys allowed in the first six levels. I did well in the first hour, doubling my stack, coasted through the second hour, and gradually crashed and got knocked out in the third hour, about halfway through. Too late to rebuy, and I had about an hour left before I needed to leave for home, so I played in a 1-2 No LImit cash game for that hour. I sat down at a new table, so all the chip stacks were about even. I had $200 in chips in front of me. About three hands in I was dealt Jack King, not suited, and called the $20 raise by another player. The flop showed two Jacks, giving me three, or trip Jacks, a pretty nice hand. One player bet $25, another went all in for about $50. I went along for this and another round of large bets until all the community cards were out. At that point there were three spades on the board, making a spade flush possible, but otherwise I thought my hand should be good. I called another bet of $25 from my dwindling stack of chips. The all-in player turned over a pair of aces, a losing hand. I asked the other better, “Do you have the flush?” He turned over Jack Nine instead, and I showed the winner, collecting about four hundred dollars (including most of my own $200 in chips)! Not a bad way to start, and if I were smart I would have left the table then, but as usual I stayed to play out my time and lost some the winnings back. I came home $107 ahead for the day, though, which is fine, lots better than losing! This entry was posted in Poker on October 24, 2010 by Todd. The big news in Atlantic City poker this week was the size of the Bad Beat Bonus at the Trump Taj Mahal. A bad beat is when you have a really good hand that SHOULD win, but get beaten by an even better hand. A Bad Beat Bonus is a pool of money collected in small amounts from every game of Hold-em at every table in the casino, which builds up into an ever larger sum as time goes by. 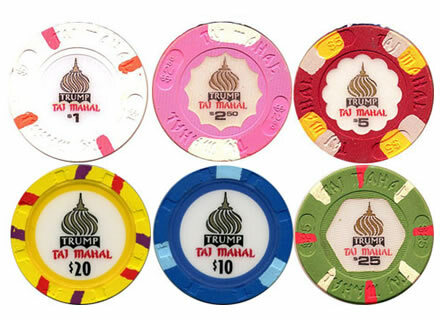 Different rules apply to what qualiifies to win the pool at various casinos, but here’s how it works at the Taj. First, at least four people have to be in the hand. Second, at least $20 has to be in the pot. Then, if you have four of a kind and are beaten by a higher four of a kind, or a straight flush, your table wins the bonus. Also, if you have a straight flush and are beaten by a higher straight flush. Further, your two hole cards have to be part of the hand in question, so having three aces in the community cards on the table and the fourth ace in your own hand doesn’t count. Now, all those hands are remarkably rare, so getting two up against each other is astronomically high odds, but it does happen, and the Bonus is usually won once in about every two week period on average. 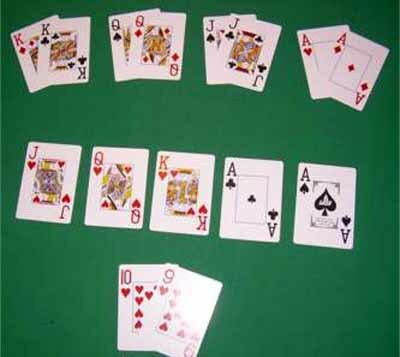 In the picture above, one player has four aces, and is beat by a straight flush, for example. (And you have to feel bad for the other players who all have full houses!) As for the payout, the player who is Bad Beaten gets half the bonus, the player he beats one quarter, and the remaining quarter is split among all the other players who were in the hand at some point, still quite a nice piece of cash! So, the big news was that the Bonus HADN’T been won at the Taj in about a month, making the value over $670,000 as of today. I had some time, and I decided to go play for a few hours. (No, I didn’t win the bonus!) I played 2-4 Limit, a Hold-em game I haven’t played in a few years, as I usually prefer No-Limit. In Limit, as you might imagine, your betting is constrained. This means it takes a lot longer to lose your entire stack of chips, conversely a lot longer to build up a winning stack. I decided to play that game because I was pretty much assured a seat at a table for as long as I wanted to play, while with No-Limit I might have lost my entire bankroll on one hand. The difficulty in winning Limit is that it doesn’t cost that much for a player to stay in a hand until all five community cards are dealt. An average hand with no raises costs you $12, so even a marginal hand is often worth staying for, unless people start raising. Sometimes everyone checks around, making it even cheaper. So, it’s quite common for a lousy hand to blossom into a winning straight or flush. The first hour or more I was getting all low cards, no pairs, and I played some, but lost steadily. Then I finally got a pair of pocket Aces…and lost to two pair. Things tend to even out over time, and in the last hour and a half my luck changed. I started getting winning hands, bringing my stack back up to where I started (from down $100 at one point), and then ahead, finishing up winning $46. Not much for almost four hours of play, but it sure beats losing. No one claimed the Bad Beat Bonus while I was there. It was fun to see the crowds trying, though. 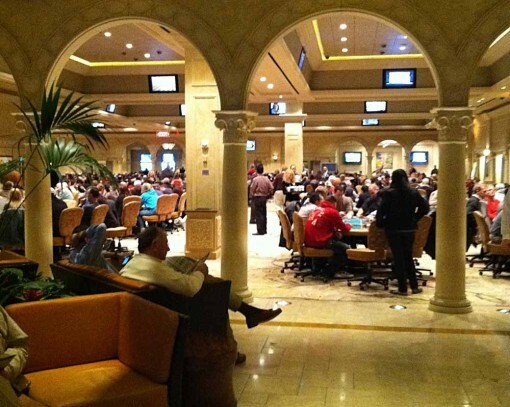 As one dealer said, lately at the Taj, every minute is like their average Saturday night, with nearly every table in the poker room full, and a line waiting to be seated. Good for the casino, the dealers and even the players, I think, at least those who know what they’re doing. I’ll be watching the Atlantic City Press to see when the Bonus is claimed, and how much the total is. Hope it isn’t a few minutes after I left, at my table! UPDATE: And here’s the winner, in a story in this morning’s AC Press. Looks like I didn’t miss seeing it happen by much! This entry was posted in Poker on June 6, 2010 by Todd.